Home » Certified Poptastic! » 20 Creative, Fun & Unique Engagement Session Ideas! Happy hump day everyone! I’m making a few changes to my blogging schedule this year and one of them is freeing up Wednesdays for inspiration-type posts. As much as I love sharing real wedding & engagement features, I do want to add some variety to what I post about. So yes expect to see a lot more funky wedding ideas from around the web, DIY projects and printables, indie music selections, vendor and product spotlights + whatever else presents itself in the coming months! For today, I thought I’d start with a look back on 20 creative, fun, unique, memorable, and couple-defining e-session ideas from our 2012 Poptastic Bride couples. Hopefully they can inspire you to veer away from “cookie cutter” and put a stamp of individuality on your own engagement session too! 20. Center your e-session on a favorite sport or hobby. A fun way to personalize your e-session is to base it around a sport or hobby you enjoy doing together! Check out some fun examples below. 19. Set your e-shoot in a carnival. If you want your e-session to reflect your playful selves, have your photographer tag along as you go on a date in a carnival! The colorful surroundings will also naturally complement the fun mood of your shoot. 18. Have a cozy At-Home e-session. Are you homebodies? Have a nice apartment? You may not have to look too far when deciding where to hold your e-session! This will also really ensure unique-to-the-two-of-you photos and is also a great way to document your pre-married home life. 17. Take photos against colorful street art and graffiti. If you’re city dwellers and would like your photos to look like they could hang in a hip urban gallery, getting photographed in front of street art will quickly do the trick! 16. Pretend to be celebrities and get snapped by paparazzi. If you want some journalistic-style photos, then get your photographer to capture you at your sweetest while you’re not looking! 15. Include animals in your e-session. Are you pet lovers? Why not include your little furry pal in your photo shoot? That should make for fun and unexpected moments! 14. Go for a stark contrast. Combine total opposites like high fashion and grit, for example.You might be surprised at how gorgeous the photos will turn out such as in the examples below! 13. Go thrifting! Or take a stroll around a street fair — or even a mall, as in one of the examples below — and have your photographer take your photo on your “date”. 11. Base your e-session on your favorite food. Sushi, s’mores, think out of the box and center your shoot around something yummy that you both like. And then make fun props to add some quirk factor! 10. Go wild with fun DIY crafts and props. If you have the artistry, inclination and time, this is a fun and colorful way to commemorate your engagement! 9. Run around town and let your photographer capture you at play. This is another great way to end up with dynamic, vibrant photos like the ones below. 7. Take inspiration from non-wedding-related sites. That’s right, step away from wedding blogs (like this one) every once in a while or else you’ll end up with photos that will look like everyone else’s! So much inspiration can be had from elsewhere, like rock and roll magazines or band record covers as the couples below prove. 6. Center your photo shoot around what you do professionally. Nothing says “you” like what you’re known to be an expert of. The couple featured in the photo below are architects so they had a totally awesome e-session on a construction site, among other locations! 5. Get messy! Express your artistic selves with a fun and colorful paint fight like this couple did. Once you’ve become responsible parents, you won’t have an excuse to act this goofy anymore so do it while you still can! 4. Get chased around town by monsters. This couple put a fun and unique spin on the strolling-around-town-e-session by running from a couple of cute cardboard creatures. 3. Take inspiration from pop culture. Have a favorite movie, TV show, book, film genre, or stage musical? Re-enact it complete with costumes, props and post-processing effects. 2. Stage an intricate silent film parody and take the photos in Black and White. If you think you can pull this off with your photographer, go for it! The best thing about taking a series of photos like this is that they can be stitched together to make a vintagey film that you can play at your wedding reception! 1. Combine your geeky interests and pull all stops to come up with a fantastic, out-of-this-world shoot that totally reflects the two of you. I don’t think I need to explain this further. Just click on the link below the photo to see how awesome this couple’s e-session turned out. Do you have awesome e-session photos? 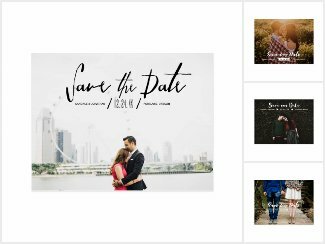 Use them on our chic and modern Save the Date templates! Did you enjoy this list of fun and creative e-session ideas from our featured 2012 couples? I hope it helps you to come up with a unique and meaningful twist for your engagement shoot. Feel free to share it with your bride friends and photographers! * For even more inspiration, you may click [ here ] to see all of our featured engagement shoots.